A few weeks ago, my friend Chow, a prolific food writer who publishes at BangkokGlutton.com, invited me to help her write some Thai food recipes to include in the updated version of her handy book, “Bangkok’s Top 50 Street Food Stalls”. One or two afternoons a week, we have gathered ingredients in her kitchen and tested and modified different recipes to try and make ones that are easily accessible to home cooks anywhere in the world. While I can’t share the recipes here, I will share some pictures of two of our recent dishes: pad thai and tom yum goong. 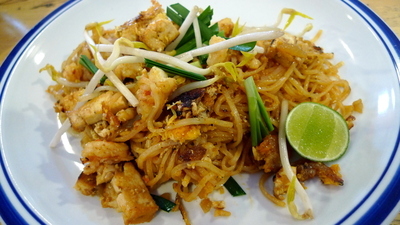 Pad thai is a common fried noodle dish that is notable for its distinct, sweet-sour sauce. Thai restaurants in the west sometimes try to make a tomato based sauce or use ketchup as a flavoring, but that isn’t an acceptable substitute for the main ingredient: tamarind. These days, tamarind is increasingly common in many countries, thanks to its use in Latin American and Indian cuisines, cultures that have large diasporas. Not long ago, I was in suburban Seattle and was able to find fresh Mexcian tamarind, using the flesh to make a sweet and sour sauce for steak. The pad thai also makes use of (moving left to right from the top row, down) pickled daikon radish, garlic, eggs, shrimp, the tamarind sauce, lime, toasted peanuts, bean sprouts, green onions, firm tofu, dried shrimp, and red chili flakes. Most of these ingredients are readily available. The pickled daikon can be replaced with well-rinsed sauerkraut in a pinch. Not shown are the dried rice noodles that form the base of the dish. These are available at any Asian market and at better-stocked supermarkets with an Asian foods section. The end result is a stir-fry of all the ingredients with an engaging flavor that is tangy and sweet, slightly spicy, and a little bit sour. A perfect balance of flavors. Now, one thing about Thai cuisine that non-Thais don’t always understand: noodle dishes (both soups and stir-fries) are generally a single-plate food. Most Thai food is served family style, with various curries and other dishes in the middle of the table to be shared and eaten along with rice. Noodle dishes, though, are usually ordered for lunch, a snack, or dinner and are consumed by a single person. So when you go to a Thai restaurant and, along with all your other dishes, order some pad thai to share, it is a little strange. I’m not saying you can’t do it – by all means, order whatever you want – but it isn’t the way the dish is eaten by Thais. The next dish we made was a tom yum soup. This herbal soup is not only rich in flavor but has significant health benefits from all the different herbs. 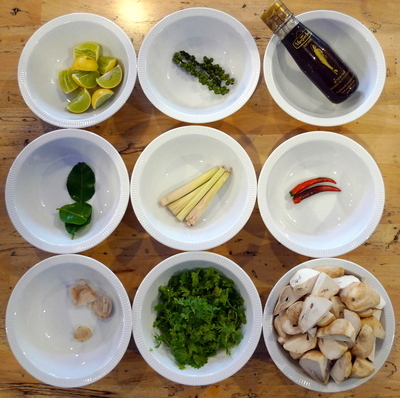 The main ingredients, from top left, are lime, peppercorns, fish sauce, kaffir lime leaf, lemongrass, chilies, galangal root, cilantro, and mushrooms. We also added prawns, called “goong” in Thai. You could also make it with chicken or tofu. The soup is made by bruising the herbal ingredients (literally beating them with a cleaver, mallet, or other heavy object) to release the oils. These are then simmered in water or, cheating a little, some broth. The fish sauce is added to make the flavor more complex and many people also add fermented chili paste. The mushrooms are cooked and then prawns are added a minute or two before serving. 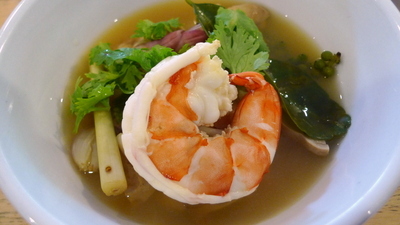 The end result is a clear broth with lots of herbal flavor, a delicately cooked prawn, and a bit of spice. An alternative version of this soup, tom kor gai, is made with chicken and is finished with some coconut milk to add richness. Usually served near the start of a Thai meal, the soup is like an appetizer, with the herbs whetting your appetite and preparing you for the complex flavors of the meal to follow. I will share more photos as we continue to experiment with the recipes. This entry was posted in Uncategorized and tagged cooking, food, padthai, thai, Thailand, tomyumgoong by christao408. Bookmark the permalink. I love how you presented this, the pictures (especially including the ingredients in the bowls-very visually appealing), along with descriptions and even tips about eating customs. Clearly the most fav post because these dishes are my most fav! Need to get the book for recipes! I’m forever searching the best way to make pad Thai. I would eat those dishes you showed here. Looks very appetizing to the pallet. Both dishes are most well known Thai food. I think the green in pad thai is garlic chives, isn’t it? Thank you Chris. I love the way you have “spelled” the various ingredients with pictures. I am emailing this post to myself. While I have plenty of tamarind and cook with it always, it is difficult for me to lay my hands on kafir lime leaves. It is actually impossible. I was in a Thai restaurant once a few years ago and was seated next to one of these plants. I ‘stole’ some leaves from there and brought them home and put them in the freezer. Next time I went to that restaurant, the plant was gone. I need to see if I can purchase a plant somewhere. Even though I don’t eat shrimp, that bowl of soup looks awfully good. Thanks for the pictures of the ingredients. Sometimes when I got to the store, looking for some exotic veg or spice, it helps to know what it looks like. Thanks Chris for a wonderful article. The shrimp that you showed is definitely De veined something that rookie cooks do not know about. I suppose if they used smaller dried shrimp you do not need to de vein them. Ty so much for sharing these yummy looking dishes and I am drooling again. I have learned to bring a bib with me when I come to see what you are cooking up.Have a great week that got here way to fast. Where will the book be available? I’m drooling with anticipation! I would love to get the recipes I adore Thai food. It is so delicious. 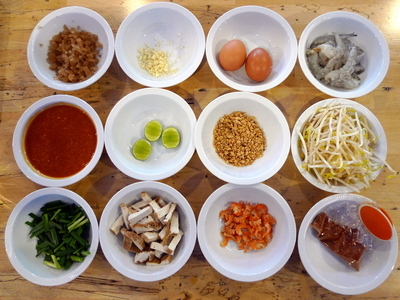 @awoolham – My hope is that as we finalize the pad thai recipe, I can shoot some video and post it. It is all about the technique, especially having a very hot pan. @Crystalinne – Thanks for the recommendation and I’m glad you enjoyed, especially the eating tips. One of the things I realized after moving here is that a large part of a culture isn’t just its food, but also the details about how that food is prepared, shared, and enjoyed. @armnatmom – I hope you have the opportunity to try them! @beautyandthebum – Different cooks and different recipes use different greens, but I think the garlic chives would be the “traditional” (with careful use of quotes) ingredient. @CurryPuffy – Start with the classics, right? @ZSA_MD – Thanks for the recommendation, Dr. Z. There is a company called Temple of Thai that imports Thai foodstuffs and can ship them, including kaffir lime leaves. Website is here. @whyzat – While this soup is traditionally made with shrimp, you could certainly substitute another protein or tofu – or you could even eat it just with mushrooms. @PPhilip – Yes, we did a quick deshelling (except for the tail) and deveining. The small dried shrimp don’t need to be deveined and, in fact, I can’t imagine how you would even try to do it! =D@Grannys_Place – Thanks for the recommendation. I’m glad you’ve learned to come to my blog prepared! Ha ha ha! @maniacsicko – Me, too. I always liked eating the soup but didn’t appreciate how elegantly simple it is until I helped make it. @murisopsis – I think there are still a few more months of recipe testing and editing before the new version is published. Her current book is available through Amazon, but with a new one coming, you might as well wait. @Texasjillcarmel – Thanks for the recommendation. Yes, it is tough to find real Thai food in the US. @firetyger – Thanks for the recommendation. As recipes get finalized, I’m going to try and film a few of them and, with Chow’s permission, share them here. Stay tuned! @light_blue_fables – If it was homemade, I’m sure it wasn’t pathetic. In fact, Friday evening I tried a new recipe for veggie burgers that appeared in the NY Times. Turned out pretty well, although the market was out of black beans so I substituted garbanzo beans, giving it more of a hummusy flavor. I do love Thai food – thank goodness I can walk to the restaurant! @christao408 – I never seen them do dried shrimp. Maybe since they are so tiny the heads of the shrimp fall off automatically? J’s favorite is the Tom Yum soup (he likes it spicy). The photos are nicely done, did you arrange the ingredients that way? damn, i envy you. i miss my days of recipe testings for a cookbook. such a great experience. @ElusiveWords – Yes, Chow wanted some photos for her book, so we were worrying about ingredient arrangement in addition to the final product. @rudyhou – You should do it again! @PPhilip – I think that, since they are so small, you just eat the shrimp heads. @Fatcat723 – Nice to have it so close!